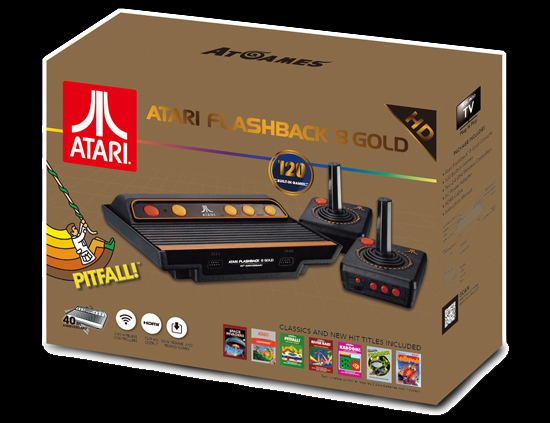 - The all-new Atari Flashback 8 Gold ($79.99) features 120 built-in all-time favorites. Games include legends like Activision’s Pitfall! and Taito’s Space Invaders, as well as many other all-time Atari 2600 classics like Kaboom!, River Raid, Centipede, and Millipede. Two all new, high performance 2.4ghz wireless controllers, styled after the Atari 2600 originals, are included, as well as two legacy controller ports for optional wired joysticks or paddles. Other all new features for the Atari Flashback 8 Gold include 720p HDMI output, scan line filtering, and a save/pause/rewind feature for every game. 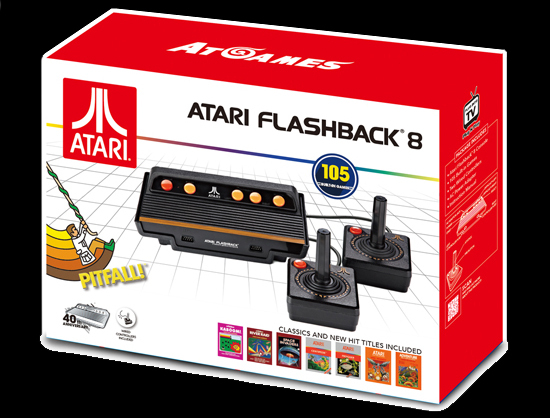 - The Atari Flashback 8 Classic Game Console ($59.99) returns in a new value-priced edition, complete with 105 all-time favorites. Amazing new additions to the game line-up include Activision legends like Pitfall!™, Kaboom!™, and River Raid™. Two wired controllers, styled after the Atari 2600 originals, are included, as well as two legacy controller ports to add your own optional wired joysticks or paddles. 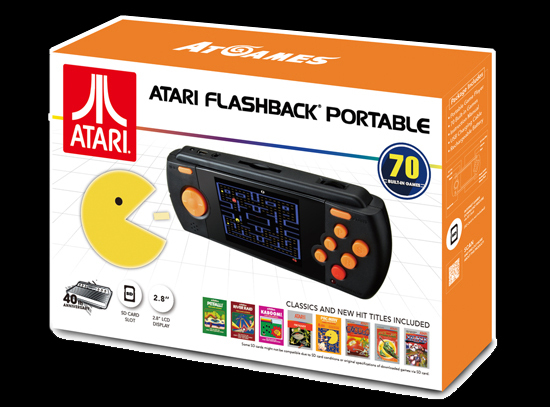 - The Atari Flashback Portable Game Player ($59.99) features an amazing selection of 70 built-in games, including the legendary BANDAI NAMCO Entertainment arcade hit, PAC-MAN. Other blockbuster games include Dig Dug, Pitfall!, and Frogger, and you can even add your own games with an optional SD card. A built-in, rechargeable battery, means the on-the-go fun never has to end. Games can be played on the portable’s built-in, high resolution 2.8” display, or on a TV via optional cable. - The all-new Sega Genesis Flashback ($79.99) has a stunning new design, reminiscent of the original console, and features 85 built-in games as well as an integrated cartridge port that plays almost all of your favorite Sega Genesis and Mega Drive original cartridges. Built-in all-time favorites include the Sonic series, Mortal Kombat series, Phantasy Star series, and Shining Force series games. Two new high performance 2.4ghz wireless controllers, styled after the Sega Genesis originals, are included, as well as two legacy controller ports for optional wired gamepads. Other new features for the Sega Genesis Flashback include 720p HDMI output, scan line filtering, and a save/pause/rewind feature for every game. - The Classic Game Console ($59.99) returns in a new value-priced edition, complete with 81 all-time favorites. Amazing new additions to the game line-up include role-playing and strategy legends, Shining Force, Shining Force II, and Shining in the Darkness. Two wired controllers, styled after the Sega Genesis originals, are included, as well as two legacy controller ports to add your own optional wired controllers. - The Ultimate Portable Game Player ($59.99) returns with an enhanced selection of 85 built-in 16-bit Sega Genesis and Mega Drive classic games. The selection of blockbuster games include new additions PAC-PANIC and Splatterhouse 2, as well as many more surprises. You can even add your own games with an optional SD card! Returning for 2017 is save game support for the included Phantasy Star series role-playing games. A built-in, rechargeable battery, means the on-the-go fun never has to end. Games can be played on the portable’s built-in, high resolution 2.8” display, or on a TV via optional cable.